YOU WANT THE WEDDING EVERYONE WISHED THEY HAD. You carefully plan every aspect of your very special day, you love magic yourself and want to share this with your guests. Once you choose a magician, how can you make sure you make the most of their time with you? Below I break down the day in to separate parts, these are the times for me to perform for everyone. I WILL BLEND IN WITH YOUR DAY. I do not need a big entrance, the day is not about me… I WILL KEEP YOUR GUESTS THOROUGHLY ENTERTAINED. My combination of stunning visual magic and a relaxing persona really helps your guests enjoy your day fully and I always have something special up my sleeve for you, the wedding couple. Just take a look at the picture above – it is NOT photoshopped, though many think it is, it’s purely an ‘eye popping’ moment captured beautifully. The timing is perfect and that doesn’t happen by accident. 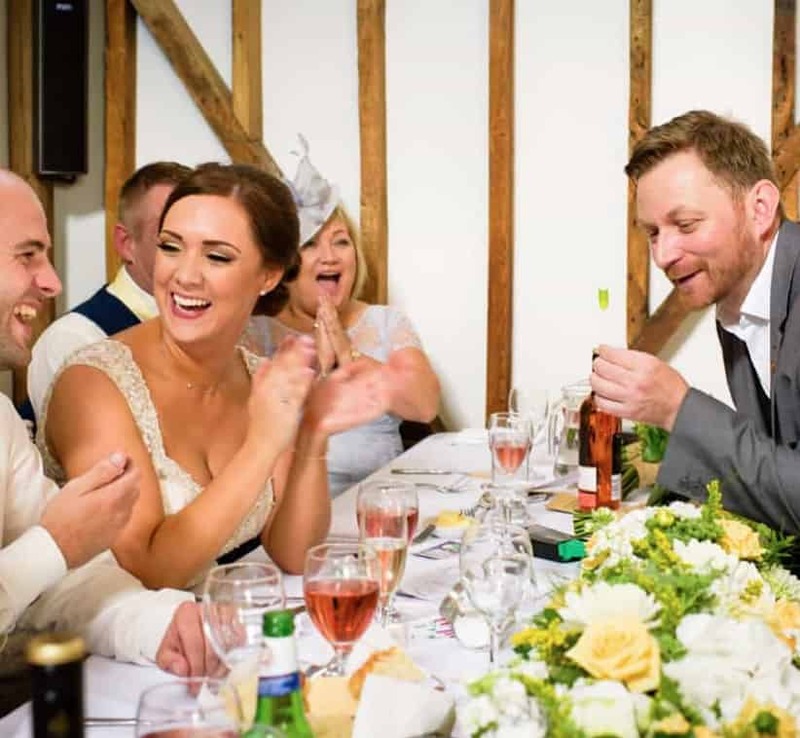 Whichever package you choose, I will liase closely with your photographer to ensure we get THE VERY BEST REACTIONS AND MOMENTS TO CAPTURE YOUR DAY. During this time you will be having photographs taken whilst your family and friends will be gathered having some informal drinks. This is a great time for me to be performing as the down time, if no entertainment provided, can often lead to groups and people dispersing. 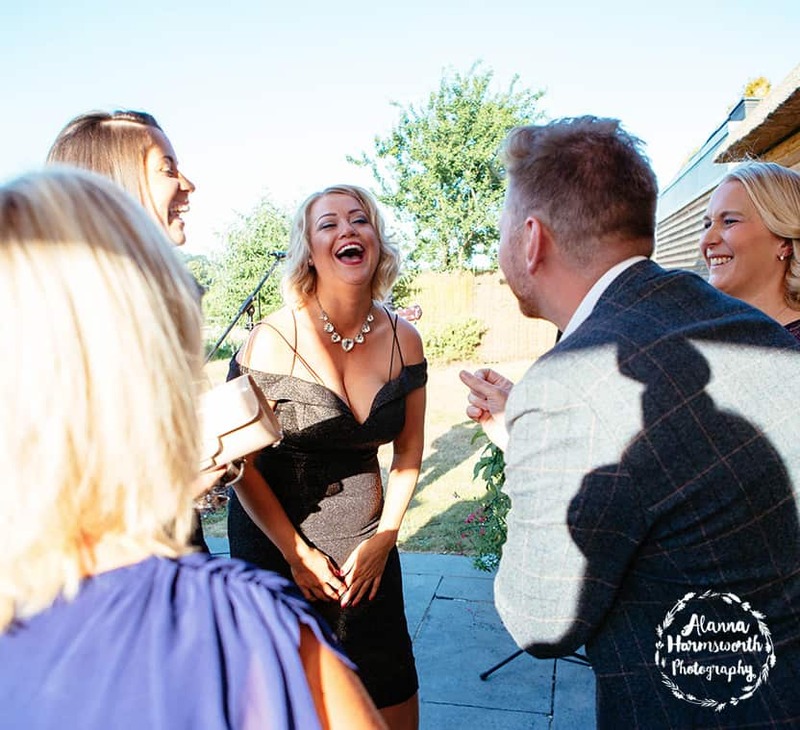 My magic is fun and the focus really is on getting everyone together and enjoying the whole experience, they will all really feel like being part of your special day, rather than just guests. I often leave spectators with souvenirs of my magic, impossible objects, signed bent coins, torn and restored cards – leaving them with a magical memory which will last a lifetime. My magic flows and the time will fly by for everyone, so any period of waiting for you to return will go un-noticed. I will also of course make sure focus is on you newly weds and ensure we have time to not only share some great magic, but also that I liase with the photographer to ensure we capture the moments. What better way to make your guests feel special than a magic performance just for them. I approach each table between courses for an individual show involving everyone and having a lot of fun. This is a great opportunity for some amazing photographs which will really capture the energy of the day. I will often come to the top table at the start and then again for one finale piece of magic after all other tables have seen me. I will liase closely with service and the photographer to ensure we make the most of this part of your day. 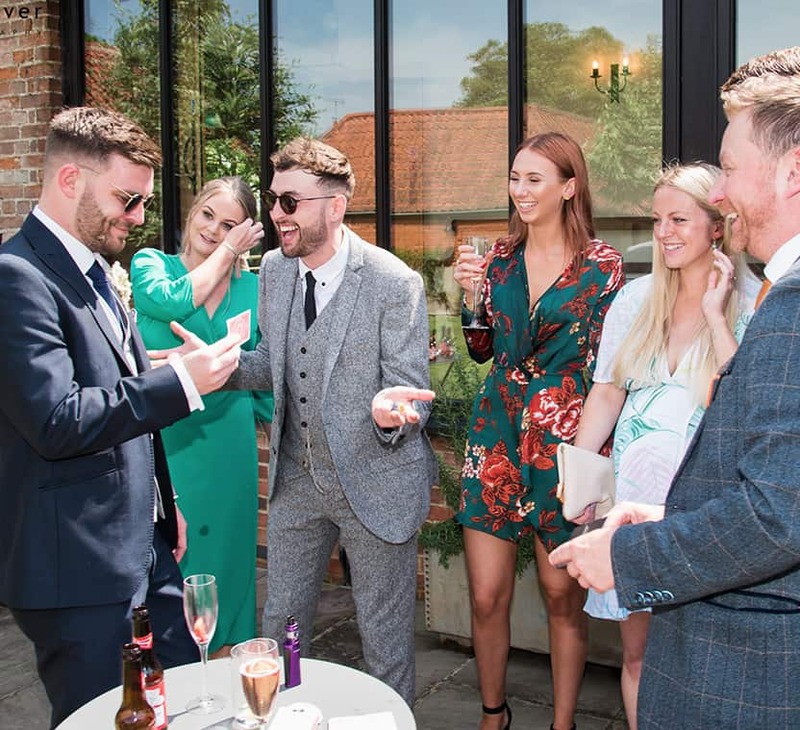 The wedding breakfast is exciting and whilst everyone is in good spirits I will keep the energy levels up with a ‘mini-show’ at each table between courses, giving everybody an unforgettable experience. This is a great time for the photographer / videographer to follow me around as the faces, wonder and laughs they capture makes some unforgettable footage. Keeping the energy going really helps when it comes to the speeches as everybody is in high spirits ready for the evening to commence. After the Wedding Breakfast the service team will be working hard to change the room over ready for the evening. 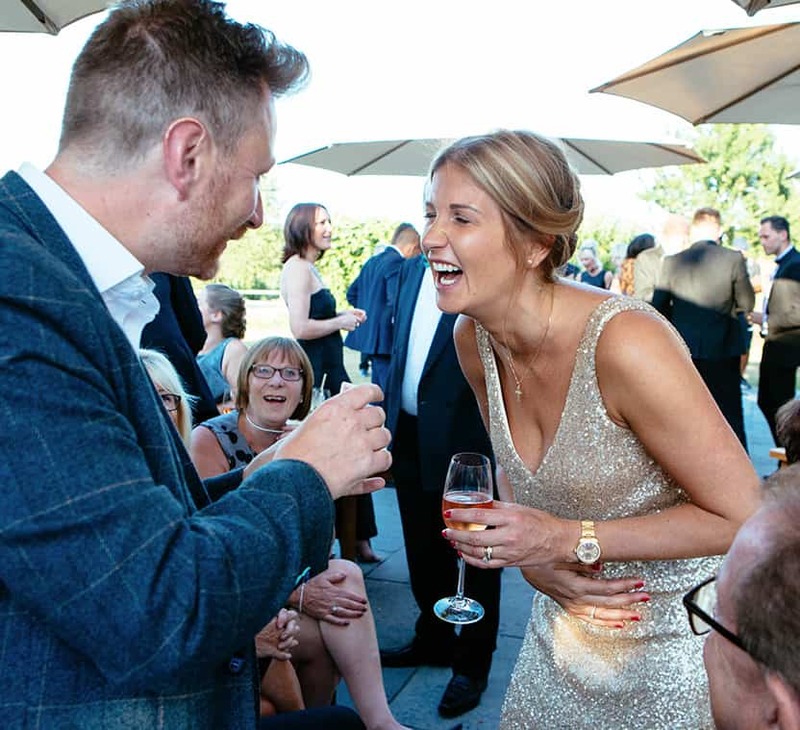 Your guests will be mingling in the bar and lounge areas, after the meal everyone is relaxed – my mix and mingle magic style is perfect to keep them entertained. Your evening guests arrive and there is always a period before everyone gets dancing – mingling around the bar and lounge rooms. General chat about the day, my style works perfectly to create and exciting buzz ready for the party ahead. The older guests will find areas to sit and chat rather than wanting a full on party, so my presence is very welcome. They will know you thought about every aspect of the day, making them feel special too. Because of the bespoke nature – only 6 ‘Ultimate Platinum Packages’ available per year. As well as a performer, I design and invent my own magic. Magicians from all over the world use my effects and I lecture at magic clubs all around the country. I am renowned worldwide for my unique style – I even appeared on the cover of a magazine headed by David Copperfield! This means I can offer you something very special and unique which you will not find with any other magician out there. If you have a theme for your wedding, perhaps as simple as a colour or even movie titles, super heroes, lego, you name it, i’m up for the challenge – all becoming more and more popular – I can taylor my magic to suit the day so it really will fit in with everything else. Small giveaways for guests are also included.